Elbow pads protect a very fragile part of the body and the best ones do a good job at it. The only problem is some elbow pads stiffen your arms up to where you can’t stick handle and shoot to your full potential. Also another problem can be them sliding a lot and not staying in place. This can be a real hassle at times and can be easily fixed by knowing your correct size. We’re gonna go ahead and cover some of the details when it comes to sizing hockey elbow pads, knowing how to wear elbow pads, and what are the best hockey elbow pads of 2019. Also be sure to check out our home page to see more reviews like our latest post Safest Top Rated Hockey Helmets Of 2019 or 10 unusual skates that actually help you skate better. If you are looking for exclusive discounts and promotions, check out our Hockey Monkey Coupon Codes. What are the different designs of elbow pads? What liner is used with these elbow pads? In our research on players questions, they were asking things like… ‘how to size hockey elbow pads’, ‘hockey elbow pads for big arms’, ‘how should hockey elbow pads fit’, and ‘hockey elbow pads that don’t slip’. All these are very good questions and we’re gonna answer them all here. First of all, sizing is very important and if you get this right, you’ll have hockey elbow pads that don’t slip. That’s what we all want right? Well here’s an easy go to guide to ice hockey elbow pads sizing! 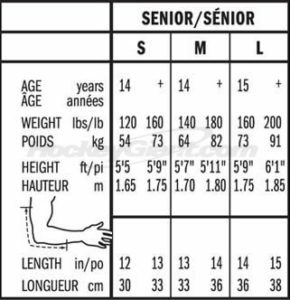 Using this chart will help you find the right size, solve you’re problem with big arms, how they should fit, and slip prevention. Soft Shell design – this has a plastic interior while the exterior is made of padded material. These designs typically tend to be entirely one-piece and are more common for the entry-level hockey players. They don’t offer as much protection as some of the higher end pads but players love these because they don’t tend to stick that far off the arm and offer great mobility. Two piece design – These are typically the most common elbow pads on the market whereby the core of the guard consist of a molded piece of plastic for the elbow and forearm guards. But with this design, you also get a bicep guard which is an additional upper piece. Three piece design – These are what we would probably say belong to premium elbow pads that have an additional segment in between the bicep and bottom portion of the pad. So, it gives you that protection of the two piece design but the added segment gives you much better mobility especially when straightening out your arm. One thing hockey players look at is the forearm protection for each design which vary slightly as you look at the different designs. Soft shells tend to be formed from single density foam but you might not always see the wrapping go all the way over your forearms. Looking at the wrapping for the two-piece design, you start seeing plastic inserts coming into this one which will give you a little bit more protection. Likewise, with the three piece, you still keep these additional plastic inserts but it will be combined with some high-end foams and a complete wrap of the forearms. So taking a look at the bicep guards with these three options, the single piece soft shell will consist of single density foam throughout. With the mid-range two piece options, you’ll see those thin plastic inserts coming in which tend to be segmented giving you a bit more protection in that upper area. Now looking at the three piece designs, you’ll see denser, thicker plastics combined with high end foams to give you that awesome protection. As you can imagine, wrapping systems are one of the key things to look at when buying your new pair of pads. You can easily buy a super expensive set of pads but if they are sliding all over the place and don’t protect the right areas, it’s going to leave you exposed to injuries out there on the ice. With your entry level soft shell designs, you’ll probably find the basic three strap elastic and Velcro system. There will be two on the bottom portion for your forearm and one at the top for the biceps. The intermediate two-piece design keeps that three strapping system but you’ll see upgrades in the materials that are used for the straps themselves. The forearms wraps tend to be nylon which keeps them nice and tight across your forearms. Finally getting into the higher-end three piece equipment, the elastic on the bicep guard is a lot softer but made of higher quality elastic. But looking at the forearm guard, that’s really we you see the difference with almost a neoprene like strap which is an awesome feature. Now a question you may have asked yourself at this point is how comfortable are these different types of deigns? For that, we need to look at what kind of liner the elbow pads have. When you look at the soft shell pads, the interior typically use a brush nylon liner which is soft and comfortable. However, this is quite basic and it’s not until you get into the two and three piece construction that you see more advanced materials being used throughout the pad. Several of these elbow pads are not for everyone because some carry a hefty price-tag. However, these pads are good enough to make it to our list of the top elbow pads on the market. Also, don’t forget you can save yourself loads of time by clicking on the name of the elbow pads, this will take you down to the review instead of having to scroll all the way down! 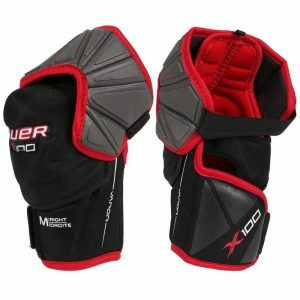 Now let’s go over the top rated hockey elbow pads of 2019! 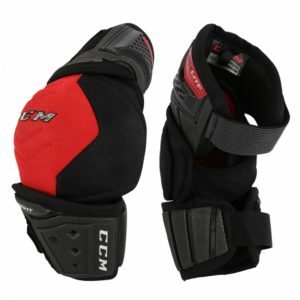 The CCM Tacks 7092 Senior Hockey Elbow Pads have the two-piece construction. The pads are strapped together and it helps you get great mobility and it will allow you to move as you want to be. The pads will not only give you mobility but great protection as well. This product by CCM offers insane level of protection and streamlined fit. The pads are super strong for a lot of reasons and one of them is the injected insert up in the bicep guard and it provides really great coverage down to the joint. On the other hand, the pads are loaded with thick density foams both on the inside and on the outside as well. So, these foams will give you good protection and comfort. Well, the D30 light foam makes these pads very demanding as the D30 light foam is smart rate sensitive foam. So, what does it mean exactly? Well, it feels very soft when you touch it while performing really well when it comes to handling the high impact attacks. The D30 light foams manage the impact energy in the best way possible. They have also used the molded PE reinforced with the D30 Lite technology. With the improved technology and better protection level this product is taking the Tacks line to the next level. 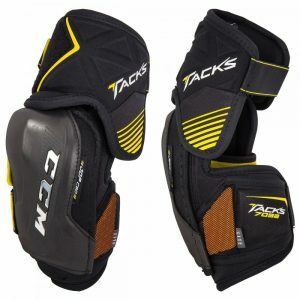 The CCM Tacks team has covered every single thing and has given equal importance to every part of the pads. They have used the molded foam armor bicep with extended coverage. They have used the raised exposed plastic insert in the forearm to give you that top level coverage. In the elbow cap they have made some changes as there are closed cell foam liners in it. So, it will help you stay dry and fresh during the game as it doesn’t absorb water. They have used the JDP cap technology in the inside and for those who don’t the JDP cap technology is one of the most popular elbow designs in the NHL today. 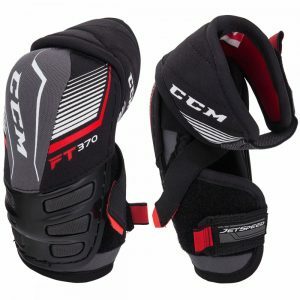 Verdict: So, the CCM Tacks 7092 Elbow Pads are very ideal and lots of professional players love to use these pads. Also very impressed with how they don’t slip with the strapping system locked in so tightly around your elbows. You can click here for current pricing on Hockey Monkey. The thing that makes the Bauer Vapor X100 Senior Hockey Elbow Pads very demanding is its ability to provide protection and a streamlined fit. These elbow pads are really lightweight but do a great job in providing amazing protection and mobility. Well, the pads are super protective and the construction of the pads clearly shows that. There are medium density foams and molded HD foams used in the elbow cap wrist guard and for armed guards. The free flex construction gives you the free-floating elbow cap and flexible segmented bicep guard. The latest technology used in the pads will give you great protection from those slashes. If we have to sum up all the features that make the pads super protective, then those features include the AEROLITE technology, Forearm guard with HD inserts, Wrist guard with Molded HD foam and PE insert and lastly the injected cap mid-density covering the cap of the pads. Bauer Vapor X100 are famous for being super protective and providing great mobility to players. You can move quickly and swiftly with these elbow pads on. This will not hinder your movements or speed of motion. You still feel light out on the ice, protected and comfortable by using this particular product. They have also used a wide shape neoprene strap in the strapping system. So, this will make you feel more comfortable and also helps you get the strong fit on your forearm as well. The elbow pads are loaded with the aerolite technology which is found in the most crucial areas of the pads. So, what does this technology do exactly? Well, first of all, this advanced technology reduces the overall weight by thirty percent while maintaining key impact properties for pro level protection. So, you are going to feel super lightweight and protective all at the same time. Verdict: For a very reasonable price, you are going to get really good elbow pads for your game. They stay in place and are very comfortable to the point where you don’t even realize that you are wearing any pads at all. You can click here for current pricing on Hockey Monkey. 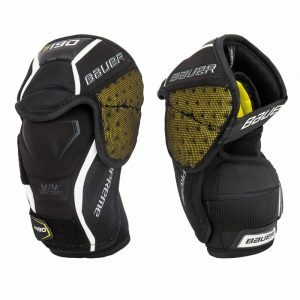 So, if you look closely at these then there are a handful of upgrades as the two-piece construction has been introduced in the Warrior Alpha QX Elbow Pads. The nylon straps are also attached with it. So, that is one of the many reasons that you will feel very comfortable and will get an amazing fit while wearing these pads. They have also introduced the VPS protection system. For those who don’t know, the VPS system is nothing but a perforated foam that you will see in the top of the bicep guard. So, this will help in the ventilation and will help the air flow quickly and will keep you nice and dry during the game. But, the overall protection and comfort level will remain the same. Well, the pads will give you premium protection and these pads are super lightweight yet very protective. 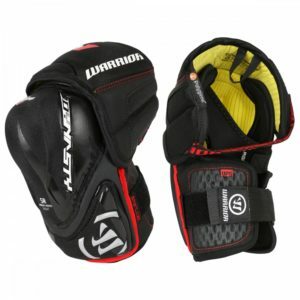 The Warrior has used the lightweight molded slash and bicep guards to give you that top level protection. There are also injected plastic pieces used as well to increase the protection level of the pads. There is also some synthetic leather on the back which will increase the durability a bit. In the forearm guard, the Warrior team has used really good high-density foams with the injected plastic. Furthermore, you are going to get the anatomical fit and that is why it will fit nicely. On the other hand, the outside of the cap has some really thick foams. So, the outside part of the pads will not only dissipate energy putting it away from your body but it will also save you in case of collision with any other player. 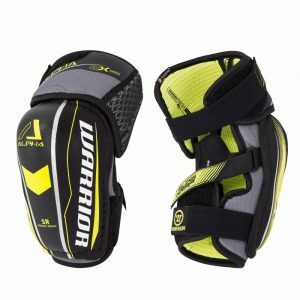 As far as the liner is concerned the Warriors has used their premier WARTECH powered by Polygiene in the Warrior Alpha QX Pro Senior Hockey Elbow Pads. So, this will help from odor causing bacteria and will keep you fresh and clean during the game. Verdict: Very versatile set of pads that offer great protection. Mid to high in terms of price range but definitely worth the extra couple of dollars. You can click here for current pricing on Hockey Monkey. These pads offer really great features that will give you a great feel on the field. These elbow pads are all about great protection, mobility and lightweight. The pads feature a molded PE dome design and very high-quality medium density foams have been used in the pads. If we talk about the construction and material used then I must say that the QuiklIite lineup is at its best. The combination of the VentShield and Zotefoam are the key components which make these pads so protective yet lightweight. I personally really like the construction of the pads as they have used the three piece construction which is made with the DryFoam technology. This technology is basically a closed cell foam which will absorb less sweat to allow the elbow pads to remain lightweight. VentShield – well, it is basically a plastic shield and it is an engineered plastic that’s going to be very sturdy and will provide you really good protection and great ventilation. So this will help you have better airflow and remain nice and dry during the game. JDP Technology – the amazing JDP technology has been used in the pads as well. This technology disperses the energy from the high impacts away from the sensitive elbow points. So, that is why the pads are super protective as all the energy is dissipated in all the other parts of the pads and your sensitive elbow joints are highly protected. The biceps guard uses the floating design so it’s going to attach by two nylon straps at the top of the pads. So, it will help your arm move freely and it will also provide really good protection and flexibility to your arms. There is molded HD foam used which is loaded with high density foams and just to let you know the CCM team has done a tremendous job in making the pads super protective and lightweight as they have also used zone foam which is an extremely lightweight but very protective. So, keep in your mind that CCM has paid huge attention to keeping the pads lightweight yet super protective. So, that is why I am very much impressed with these. These pads are super protective, flexible, lightweight and are loaded with advanced technology. So, what else do you want in the pads? Furthermore, the pads also have the moisture wicking properties because of the very good mesh which is very soft, will look your elbow in place and cushioned so you arm is going to be very safe, dryer and super comfortable. This will also dissipate the energy away from your arm as well. Verdict: Unbelievably lightweight, to the point where it almost feels like you are not wearing them. You can click here for current pricing on Hockey Monkey. These power player pads are packed with a lot of high end technology starting with the free flex design. This allows the forearms to move independently from the hard elbow cap. The bicep guard is attached by a strap which allows it to be extremely flexible and move independent of the elbow cap too. There is also molded foam on top of this hard elbow cap which gives you two way protection including you and other players out there on the rink. The bicep guard uses Aerolite foam which is a high density foam considered to be 30% lighter than other traditional high density foams while still maintaining its high impact resistance so its going to be just as protective. Its also reinforced by a plastic insert to help reinforce that protection as well. Now in the forearm guard we are going to see Curv composite technology, which means it extremely protective especially against slashes as well as being very lightweight. This area is reinforced by Aerolite foam increasing the quality of protection. The interior features 37.5 technology which is the fabric used to accelerate the evaporation process by using the body heat to help speed up that process up to 5x faster than other similar fabrics. There is also transfer mesh which allows the air to flow in between the different layers of the fabrics to help enhance the 37.5 and keep you even cooler out there on the ring. The fabric is a very nice feel and adds to the comfort of the touch. The three strap system gives you a really good fit and is extremely lightweight. For a top of the line, this outperforms all other elbow pads by a distance. During my game, I also noticed that the pads stayed relatively cool which is due to the high quality air circulation system engineered by the makers. The liner is a yellow material which premium mesh referred to as Wartech FNC liner. This also added to keeping the pads cool as the moisture was spread across the fabric which gives you accelerated evaporation. The liner is infused with polygiene which prevents the formation of odor forming bacteria keeping your gear cool and fresh. The Easton Synergy is personally my favorite elbow cap and outperforms all others on the market. I found the overall profile to be really lightweight and comfortable when out on the rink. My elbows had really great airflow and breath-ability largely due to to the air vented molded plastic design of the elbow cap. I also noticed the lattice design consisting of really lightweight high density foam which helps with the air flow without compromising protection. I had heard about Easton’s top of the line synergy equipment for some time but I was impressed by it’s hexagonal designed foam in the bicep and forearm area. The design was extremely lightweight but really highly protective especially during high impact collisions. The foam is backed by a molded PE plastic which is segmented for greater flexibility and to wrap right around your bicep and forearm. Inside the pads, there is the Helix 10 lining the elbow pocket. Now the Helix 10 is an engineered foam designed to mitigate high energy impacts. Most importantly, the foam around the elbow is very cushioned like a memory foam which makes it feel really comfortable. Easton has also included its bio dry liner which is antimicrobial so prevents the formation of odor causing bacteria. This is also a three strap system which adds onto the really comfortable fit especially the strap across the elbow crease which helps improve the air. All in all, this three piece design allows the parts to operate independent of each other providing a flexible fit while remaining really lightweight. 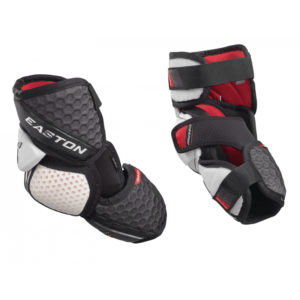 Easton has also made sure the pads are not bulky through the use of hex membrane and high density foams while not comprising on the quality of protection. Verdict: So lightweight and protective, these are a great option for anyone looking for a bargain. You can click here for current pricing on Hockey Monkey. So, the WinnWell Classic Senior Hockey Elbow Pads has some really great features. You are going to get amazing protection, super comfort and above all an amazing fit as well. One of the most highlighting point about the pads is its classical mixture of tradition and technology. The WinnWell team has done a great job with this product as they have introduced some really cool features and has given a traditional touch to it as well. First of all, the construction of the pads is really good as it will allow you more movement and better durability. You will be able to make more shots with more momentum and energy transfer just because of the flexibility this product is going to provide you. On the other hand, the three-strap system in it is really good as well. The quality of the material is really amazing too as the WinnWell team has done a tremendous job by providing the best possible material in the pads. There is almost everything for all the possible problems. Like, the WinnWell team has used a fabric which will deal with the odor causing bacteria and will get rid of the smell and will make you feel fresh and cool during the game. The latest technology used in it will kill all the bacteria. The Patented CleanSport NXT technology has been used to kill the odor causing bacteria. The three strap Velcro system is really great as it has increased the freedom of movement but you should keep in mind that it will not hinder your range. 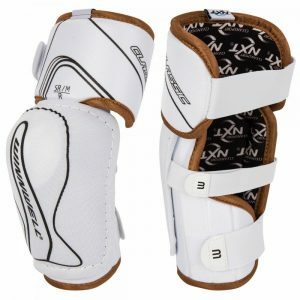 Verdict: There is no doubt that the WinnWell Classic Senior Hockey Elbow Pads is a valuable piece of equipment and that too for a very reasonable price. You are never going to find a product like this one on Hockey Monkey in this range of money. The main purpose of the CCM Jetspeed FT370 Senior Hockey Elbow Pads was to make it super lightweight and protective. When you are wearing these pads then you are going to weight any weight at all and that’s what will help you to make swift moments at crucial moments. Just to let you know the CCM team has made it very lightweight yet the pads are highly protective and durable. But, wait there are some other amazing features about elbow pads that you should know as well. One of the most highlighted features of the pads is the amazing construction. The amazing construction is all about the great mobility and comfort. These elbow pads will give you ease and will allow you to move quickly and swiftly. The CCM Jetspeed this particular product is all about great mobility, fit and insane protection. Because of the big upgrades in the construction of the pads that is why it gives you an extra range of motion while maintaining that great motion. The JDP Design – The JDP technology is an amazing and unique design used by the CCM in these pads. This design helps in deflecting the impact energy from the elbow joint and into the pads where it can be absorbed in the best way possible. The strapping system of the pads is really good as well. You are getting a nice grip and protection and they have done a great job with the strapping system of the pads. The strapping system allows you to adjust the fitting of the pads as per your demand and this what I really like about the pads. They have also added the ROCKETFRAME COMPOSITE as well for better mobility, adjustability and protection. Verdict: For me, the biggest bonus is the price point! You get such incredible protection and mobility without having to invest a premium amount like here on Hockey Monkey. There are so many pads above this price range which I have found don’t offer anywhere near this level of quality and protection so you can’t go wrong with these. The Bauer Supreme S190 pads are all about great protection, comfort and durability. There is so much to explore like the amazing technology used by Bauer or even the great anatomical fit of the pads. There is a 3 Strap System with anchor and overlock strap. But if we talk about the construction of the pads then they have used the two-piece construction in the pads. One of the best parts about the construction of the pads is that it will not restrict your movements and you can increase your range of motions. 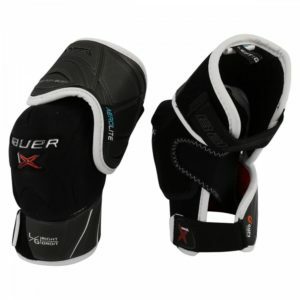 But, the Bauer team has not compromised with the protection as well because the pads are super strong and protective. If we see the forearm guards then there are high density foams used in this part of the pads. You are definitely going to get elite level protection because the Bauer team has also used the molded plastic inserts with the high-density foams for that top-level protection. The pads are loaded with some really high quality and high density in different parts of the pads to provide insane protection. The forearm and the biceps are getting the same injected plastic cap here thicker foams again are being used in this section as well. So, if we see the Bauer team has paid huge attention to the high-density foams and have used it in different parts of the pads to make the pads very powerful and protective. As far as the technology is concerned, the Bauer team has used the XRD foam and that has certainly taken the pads to the next level. And just to let you know, this is the most protective foam that the Bauer is offering. The position of this is so amazing as it will help you deal with all those high impact energy shots in the best way possible. It is very comfortable as it also has that memory foam type feel. The liner also has their thermo Max Liner and this is one of the most premier liners they’ve ever used in the pads. Above all, we cannot overlook the sanitized active fresh technology this is directly integrated into the liner itself. So, here is your answer for all the odor causing bacteria as this technology will keep you nice and dry during the game and no odor causing bacteria will disturb you. Verdict: This is also a fantastic overall set of pads and well deserved place on the list. Very comfortable and mobility too. Not the biggest fan of the colour scheme but apart from that, a great buy! Check them out here on Hockey Monkey. We hope you found this review helpful! Be sure to browse the site, we have a ton of helpful content on just about everything like The Best Hockey Sticks Of 2019 Review. Thanks for visiting!